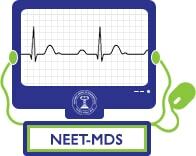 Candidates who have applied for the NEET MDS 2019 Exam must check the NEET MDS 2019 Exam Pattern. The paper has been set by the conducting authority, National Board of Examinations. Out of 17 different subjects, 240 objective questions from the BDS curriculum will be asked in the NEET MDS 2019 Exam. NOTE: Kindly note that the applicant candidates shall be allocated to appear either in FORENOON session or in the AFTERNOON session i.e. the NEET- MDS comprises ONE session/candidate only. Mode of Answering: The examination shall be a multiple choice questions test delivered using computers network (CBT) as per scheme prescribed. Basic Pattern: The exam comprises of 240 Multiple Choices, single correct response questions in English language only. Total time allotted is 3hours. Marking Scheme: 1 mark will be awarded for every right response. Note: The syllabus of the above topics shall be as per the latest Regulations for BDS courses notified by the Dental Council of India with prior approval of the Govt. of India.